66873 Lance Corporal John Harvey Endacott of the 1st/5th Battalion, the Devonshire Regiment. Son of Edwin and Elizabeth Endacott. Born in Throwleigh in 1894. Died in France 13 September 1918 aged 24. CH 1987 (S) John Henry Irish of the Royal Marines Light Infantry, the 1st Royal Marine Battalion of the Royal Naval Division. Son of Edmund and Bessie Irish of Cator Farm, Widecombe.. Born in Widecombe in the April of 1896. He enlisted 11 December 1915. Died at Ypres 26 October 1917 aged 21. 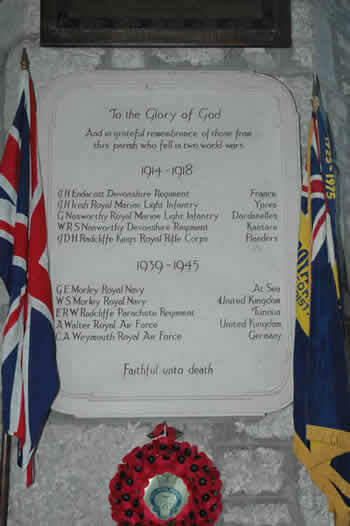 PLY 16598 Private George Nosworthy of the Royal Marines Light Infantry, the Plymouth Battalion, Royal Naval Division. Soon of James and Elizabeth Nosworthy of Widecombe. Born in Widecombe 14 June 1896. He enlisterd 25 May 1915. Died i n the Dardanelles 13 July 1915 aged 19. 203053 Private William Robert Nosworthy of the 2nd/ 4th Battalion, the Devonshire Regiment. Son of William and Elizabeth Nosworthy of Widecombe. Born in Widecombe in the March Quarter of 1891. Died in Kantara 22 January 1918 aged 27. Captain John Douglas Henderson Radcliffe of the 7th Battalion, the King's Royal Rifle Corps. Son of Alexander and Isabel Radcliffe of Kensington Square; husband of Garlidna Radcliffe. Born in Kengington in 1886. Died in Flanders 30 July 1915 aged 30. Fellow of All Souls College, Oxford. C/H/D/X/63 Able Seaman Gilbert Edgar Morley of the Royal Navy Volunteer Reserve, HM Submarine Unbeaten. Son of Walter Samuel Morley (See below) and his wife Queenie. Born in Widecombe in the March Quarter of 1916. Died 11 November 1942 aged 26' after HM Sub. Unbeaten was sunk in error by an RAF Wellington from Bomber Command. D/240051 Chief Petty Officer Telegraphist Walter Samuel Morley of the Royal Navy, HMS Scotia. Son of John and Sarah Morely; husband of Queenie; father of Gilbert Edgar Morley (see above). Born in Runcorn in the September Quarter of 1884. Died 5 January 1945 aged 60. Buried in the cemetery in Newton Abbot. Captain Edmund Reynolds Willoughby Radcliffe of the The Parachute Regiment. Son of Alexander Nelson Radcliffe and his wife Isabel Grace Radcliffe. ; husband of Enid Radcliff (née Elliot). Born in Kensington 3 December 1899 . Died in Tunisia 8 March 1943 aged 43. He appears on the MCC Roll of Honour at Lords. 1155861 Leading Aircraftman Alec Walter of the RAF Volunteer Rreserve. Son of Fred and Elizabeth Walter of Widecombe in the Moor; husband of Lilian Bessie Walter of Newton Abbot. Born in Widecombe in the September Quarter of 1915. Died in the UK 26 Deccember 1942 aged 27. Buried in Widecombe churchyard. 524640 Sergeant (Navigator/ Flight Engineer) Charles Anthony Weymouth of the RAF, 44 Squadron. Son of Anthony and Blanche Weymouth. Born in Kingsbridge in the March Quarter of 1914. Died 23 November 1942 aged 28 when his plane was lost without trace on the way to Germany. He has no known grave.